WASHINGTON — President Donald Trump wants you to forget about that whole Obamacare thing. "Virtually dead," he said on Tuesday. "In its final legs." That was a slight upgrade from the health care program's condition on Monday, when the president declared it "finished" and "gone," and told reporters they "shouldn’t even mention" it. "There’s no such thing as Obamacare anymore," Trump added. Whatever the president wants to call it, millions of Americans will soon purchase insurance plans on state and federal exchanges during the open enrollment period for Obamacare, which begins Nov. 1 and ends Dec. 15. Millions will still be eligible to receive federal subsidies if they qualify for assistance and millions more will be able to obtain Medicaid coverage through Obamacare. Despite his best efforts, Trump is stuck with the reality that Obamacare is still the law of the land and that his own administration is responsible for overseeing the health care system that's been shaped by it. In recent days, he's sent mixed messages as to what he plans to do about it. The president has taken aim at the law with an executive order that could undermine Obamacare's insurance exchanges and a decision to cut off cost-sharing reduction payments (CSR) that reimburse insurers for lowering deductibles. Trump has highlighted the upcoming premium increases, which his own actions have helped encourage, as evidence the law is "dead." 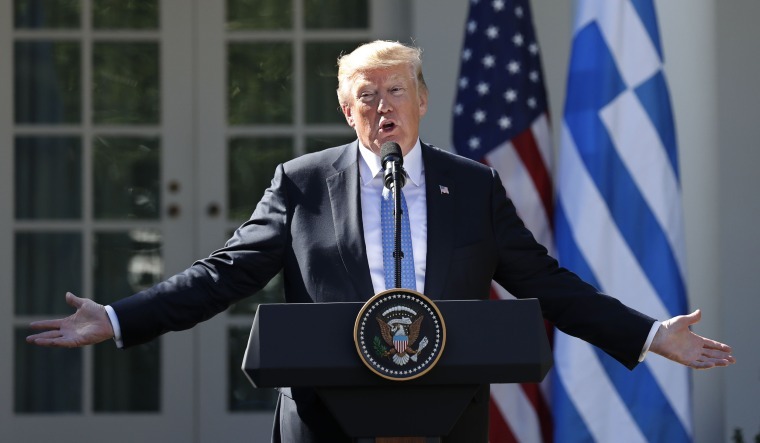 At a news conference with Greek Prime Minister Alexis Tsipras on Tuesday at the White House, Trump decried the CSR payments as money that insurers use to "line their pockets" and "raise their stock prices." But he also appeared to bless a bipartisan proposal by Sens. Lamar Alexander, R-Tenn., and Patty Murray, D-Wash., that would reinstate the CSR payments while loosening some Obamacare regulations. "The solution will be for about a year or two years, and it will get us over this intermediate hump," Trump said, adding he had been "involved" in their negotiations. The White House almost immediately began pushing back against the idea that Trump had endorsed the deal, instead portraying the Alexander-Murray agreement as only the start of negotiations. Trump had boasted on Monday that his decision to cut off CSR payments "brought Republicans and Democrats together," another signal that he was interested in a deal, even as he said his goal was still to repeal the law sometime next year. Trump’s sudden turn toward more modest bipartisan fixes has run counter to his administration’s typical approach to the law, which has usually consisted of tweaks that seem aimed at raising premiums and reducing enrollment. In addition to the CSR decision, the Trump administration has slashed advertising by 90 percent for enrollment, cut funding for customer service and canceled outreach events, which have all prompted cries of Obamacare sabotage from Democrats and health care activists. Insurers and industry analysts say the uncertainty over the White House's approach has already raised premiums for 2018. Some experts and advocates warn that his latest flurry of actions, along with his regular claims of the law’s demise, could lead customers to wrongly believe they’ll no longer be eligible to sign up for a plan. "People are confused," said Lori Lodes, co-founder of Get America Covered, an outside effort to enroll Americans through Obamacare. "All of the actions the Trump administration has taken to roll back outreach and upend how the marketplaces work is creating even more confusion."